Want to connect with Robson? I studied English Language, Literature and Education at Federal University of Espirito Santo in Brazil from 2006 until 2010. During that time, I have taken specific Language and Education courses, such as Phonetics, Morphosyntax, Semantics, Applied Linguistics, as well as Educational Psychology, Didactics, English Teaching Methods and Approaches, all of which permeated by lots of academic reading and writing. I did research in language teaching and learning with emphasis in learning strategies to explore a variety of techniques for helping my students learn languages in a rather easy and motivating way. I also have a graduate certificate in Distance Education and the use of technology for teaching and learning purposes. Thus, I know how to with using virtual learning environments, social media and other commonly used APPs and tools in order to facilitate learning. Before moving to the US to continue my graduate studies in Educational Technology, I had been and English teacher in Brazil for approximately ten years, teaching students from the 5th grade up to college undergraduates in my language classes. Besides my experience within the classroom, I also have been tutoring since high school, not only offering private English language tutoring sessions to adults but also delivering remedial teaching sessions to the kids from my community. I can also provide tutoring regarding Academic Research methods and writing, since I oftentimes have peer-reviewed thesis upon request, and translated several Abstracts. 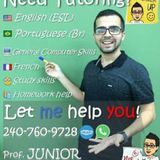 Whether you are an adult looking for Portuguese (Br) and English serious language skills improvement or a parent looking for a committed and resourceful language tutor to support your child on advancing in their studies and building up confidence on homework completion or learning a foreign language, just contact me and we can discuss about your expectations regarding the tutoring sessions.